The story of the world's smallest biplane, and its pilot. The Bumble Bee Airplane is the smallest piloted aircraft in the world, though it’s not the lightest. Robert H. Starr is not a name many will be familiar with. And yet, for an unfamiliar name, he has accomplished an incredible amount. Over a life spent with his head literally in the clouds, Starr logged over 15,000 hours in the air, starting as far back as flying fighter planes during World War II. After the WWII, Starr continued to fly in a variety of aircraft from Piper Cubs to F-86 Sabre Jets. And during that time, he also served in a variety of positions, ranging from a pilot flying P-40’s and 51’s for the 14th Air Force Flying Tigers in China, to an aerobatic pilot for Air Shows across the US, to a test pilot for many experimental aircraft. It is perhaps the latter, his love for experimental aircraft (specifically very, very small experimental aircraft), which has gained him the most attention and notoriety, and led to the flight of the Bumble Bee airplane. In 1949, he was the only pilot able to fly the “JR”, the world’s smallest piloted airplane at the time, without it cracking and breaking1. He then helped build and pilot the Sky Baby in 1954, again setting a world record for the smallest piloted plane. These projects provided him with considerable knowledge and experience in the area of experimental plane building, especially ones of the petite variety. So when Starr found it difficult receiving proper credit for his contributions to these early experimental micro aircraft, he decided to build his own aircraft and establish a new world record. 30 years later, in January 1984, he achieved his goal with the Bumblebee 12. However, in August of that same year, another aviator by the name of Don Stits3 built an even smaller monoplane called the ‘Baby Bird’, and flew away with the world record. Though Starr still had the world record for the smallest Biplane, he began work on a new craft, the Bumblebee 2. Though similar on a design level, the Bumblebee 2 was smaller and lighter than its predecessor. 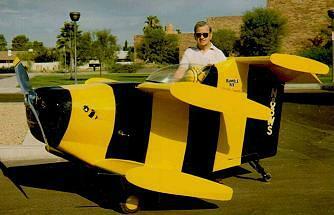 On the 8th of May, 1988, at the age of 64, Robert H. Starr set a new world record for the smallest biplane with the Bumblebee 24, though the overall record still eluded him5. At a length of 8 feet and 10 inches, and with a wingspan of 5 feet and 6 inches, the Bumblebee 2 still holds the world record for the smallest piloted biplane. Sadly, this particular triumph was laced with a healthy dose of tragedy when on the Bumblebee 2’s final flight of the day, its wee engine quit and the diminutive plane dropped from the sky, completely destroying itself in the resulting impact and severely injuring Starr. After a time, Starr recovered from his injuries, though he never tried to revive the Bumblebee 2. The Bumblebee 1, still in top shape, was donated to the Pima Air Museum in Tuscon, Arizona, where it remains on permanent display. After this point, not much is known about what happened to Mr. Starr. Did he continue to build and fly? Did he pursue the title any further? One can only hope that he did and that if he is still alive today, he continues to look skyward with wonder and appreciate the beauty of a soaring plane, realizing his small, but interesting place in aviation history with the flight of the Bumble Bee airplane. BONUS VIDEO: In case you ever wondered what the Flight of the Bumblebee looked like on Japanese TV. BONUS VIDEO: Footage of the Bumblebee at the Pima Air Museum, with narration of the story. 1 Precious little information can be found about this, and so we are left to wonder first, exactly what the other pilots were doing that was causing the plane to crack and break, and second, what caused Starr to think he wouldn’t have the same luck. 2 No one knows for sure why Starr chose the name ‘Bumblebee’ for his plane. But there is a generally accepted theory. Bumblebees shouldn’t have enough wing area to fly effectively, yet fly effectively they do. And much like a bumblebee, most people thought Starr’s plane shouldn’t be able to fly with its limited wing area, and in much the same way as its insect namesake, the Bumblebee flies too. 3 This is where things get interesting. Donald Stits, the designer of the Baby Bird, was the son of Ray Stits, the co-builder of the Sky Baby. 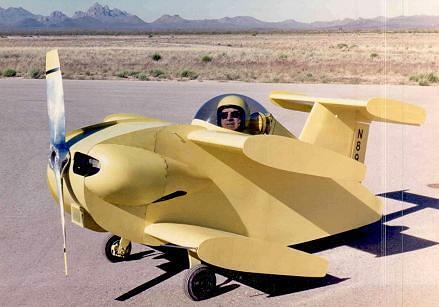 Now, if you remember, Starr set off to build the Bumblebee to de-seat the Sky Baby as the record holder for World’s Smallest Plane, because of a perceived lack of recognition. It appears Starr and Ray Stits had a falling out. Starr was successful in his quest in January of 1984. However, a scant 7 months later, Don Stits (Ray’s son) takes the record again with the baby Bird, at which point Starr builds an even smaller plane, but is still denied the overall title. What’s that line about life being stranger than fiction? 5 Donald Stits Baby Bird still held onto the record, though this is a somewhat muddled issue. The Bumblebee 2 is both shorter in length and wingspan than the Baby Bird, but when deciding the record holder, the judges decided that because the Bumblebee 2 was roughly 150 pounds heavier than the Baby Bird, it was a larger aircraft. Thank you for publishing this. I remember reading of him and his accomplishments in the 80’s. You’re welcome. It was a fascinating story to write about, and I’m always surprised it’s not more well known. Why doesn’t Ken Coward’s Wee Bee count? It only weighed 170 lbs. There are clear pictures of him flying it at altitude, as well as carrying it on the tarmac! There are a handful of different considerations when it comes to deciding the ‘smallest airplane’ status. And though the Wee Bee was considered one of the first to hold ‘world’s smallest airplane’ status, I’m guessing that it was eventually dethroned by others due mostly to size. The Wee Bee was 14 feet 2 inches long and had a wingspan of 18 feet, where the Bumble Bee II (a biplane) was 8 feet 10 inches long and had a wingspan of only 5 feet 6 inches, and the Baby Bird (a monoplane) was 11 feet long with a wingspan of 6 feet and 3 inches. Now, by weight, the Wee Bee still beats them out, with a 210 pound empty weight (that weight is according to what I’m finding), vs 396 pounds for the Bumble Bee II and 252 for the Baby Bird. However, both the Baby Bird and Bumble Bee II had a spot for the pilot inside the airplane, where the Wee Bee required the pilot to ride strapped to the top of the fuselage, which may have factored into the decision as well. All in all, they’re all still very impressive, if not strictly practical, feats of aircraft engineering.